Adding a lamination process to printed output has a large influence on the resultant color. (Solids, Gray Balance and TVI), not the printed sheet before lamination. But back engineering it can be a challenge. This challenge is minimized by using ChromaChecker and our steps that we have outlined here. The customer chose to perform a dedicated print run and start from linear plate curves. and have been measured. The TVI-11 control strips enabled additional within-page variation analysis. Measurements have been grouped and analyzed. and the customer has no desire to improve press to reduce this number. or accuracy until mechanics of press are improved. The new set of plates for the same test form were used for the second print run. Now the Press production passes ISO 12647-2. For this second verification run, the press operator finished make ready and printed 500 sheets “verification pages.” From this run: 3 sheets were pulled for every 50 printed have been selected, so 30 sheets in total. For each pull- one for measurement as it is, one for archival purpose and one for the lamination. Above we can see that lamination greatly changed both solids and tints, causing them to fail ISO 12647-2 conformance. Due to the matte lamination process, the density has been decreased, and it is reflected in numbers. Multiple pages pulled from the production run were measured and used to generate an ICC profiles for the press both before and after the lamination process. 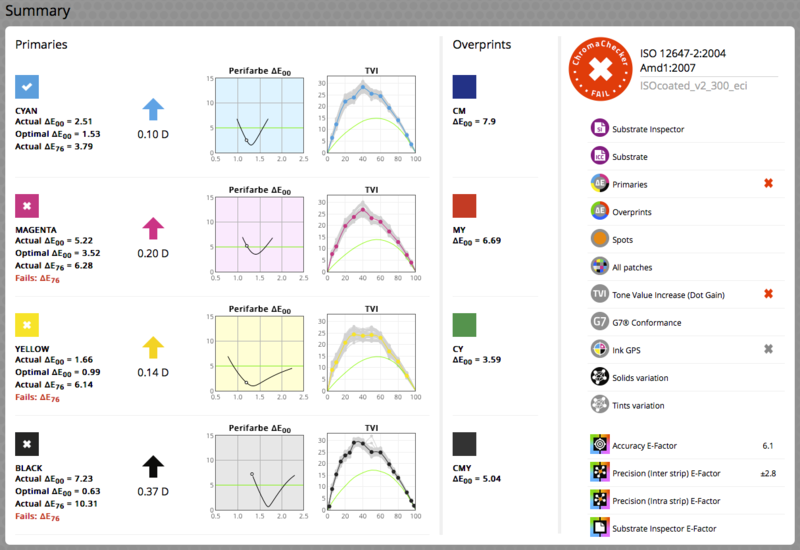 The gamut comparison (ICC Profile Inspector) graphically shows how much the matte lamination reduced solids, especially black and overprints. The “After-lamination” ICC profile was used for a Proof simulation resulting in a visual match which was very good in customers perception and customer was very satisfied with achieved appearance. Unfortunately, the final gamut was reduced, but due to the matte lamination film used, that was the actual result. Original Artwork is in ISO Coated v.2 color space. 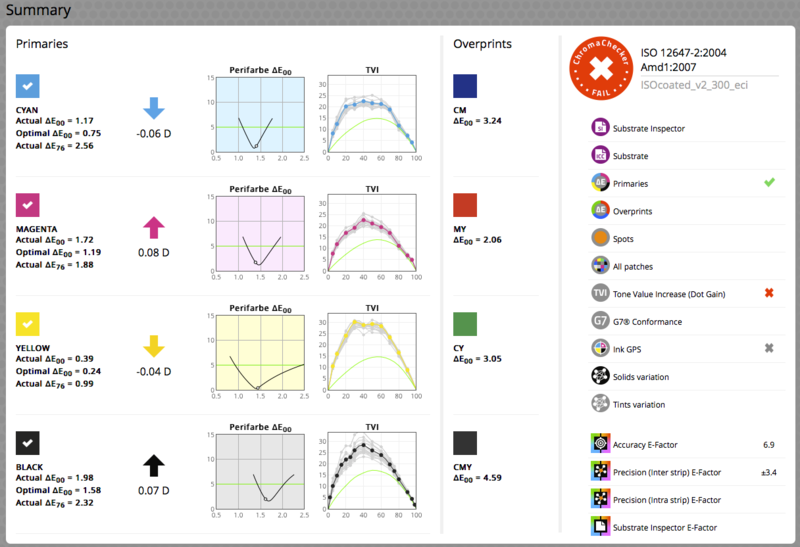 The proofing queue is configured in ACH to perform a DeviceLink conversion from oryginal artwork profile to "Proofer profile" using Relative Colorimetric with BPC. The output file is printed on Proofer. Files come into the Color Hub with an After-Lamination profile but the system is treating them like Before-Lamination. Embedded profiles are ignored! Next DeviceLink convesrsion is applied. Make plates using current plate (TRCA) curves. This customer is applying TRCA curves using 3rd ACH queue - dedicated for this purpose only. Input profile is the same as output. Additionally, a corrected TAC / black generation settings can be applied to save inks and make grays more stable. Make two tracks in Chromachecker Print Inspector. One for the press operator, and one for the final post laminated product. 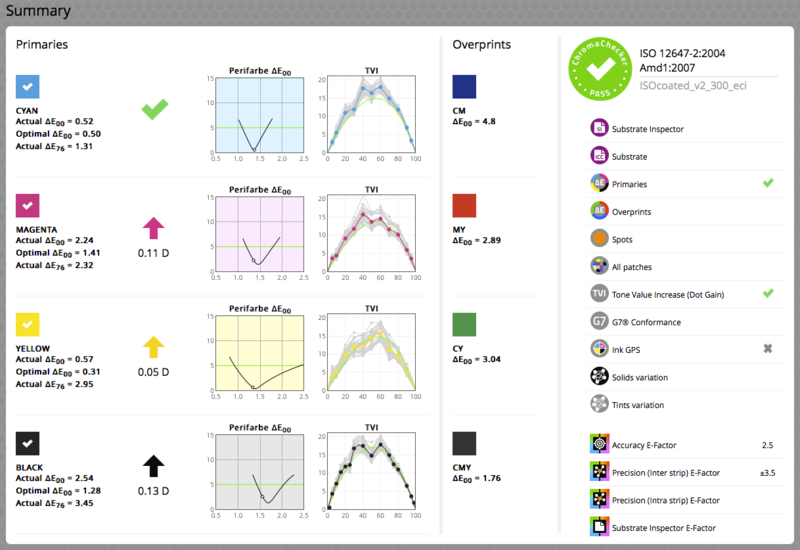 For press operator use “Before-Lamination” profile as a target OK Sheet for ChromaChecker Print Inspector track to help the press operator make the press hit this expected target. Use a proofing tolerance for this queue, because TVI and Gray balance will not be correct until the lamination process is applied. Measure control strip of laminated production and upload data to “After Lamination” track in ChromaChecker which will confirm G7 or ISO Conformance of the laminated product. one for press operator only – simulation of how the press needs to print in order to get the customer result (“Before-Lamination” profile – lighter tints and much stronger solids). Future lamination process will increase dot gain and reduce the density of the solids – but press operator does not need to understand this. 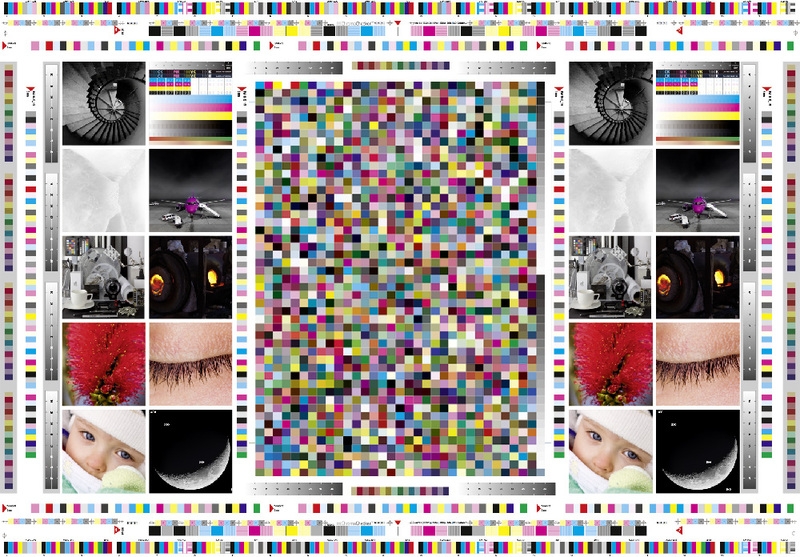 We can observe color hue shift and post production dot gain issue visually. Lamination is a process that has a huge influence on the color reproduction process. Lamination affects all color aspects of a print, not just density. Overprints are affected more than primaries - we can observe higher deviation with overprints - and we have to take into account that most images are built from overprints. Lamination causes post production dot-gain (in this case it was about 11%) and it means that all tints may become fuller and darker, causing shadow details to disappear. ChromaChecker makes it possible to create ICC profiles from small control strips and perform profiling and calibration from production prints. Print Inspector, Curve Inspector, and ICC Profile Inspector make this tough process predictable and manageable while eliminating dedicated press runs.